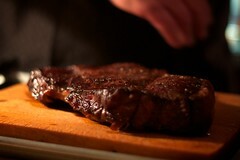 Service Untitled» Blog Archive » Customer service at “stake” at Morton’s Steakhouse? Customer service at “stake” at Morton’s Steakhouse? CherylAugust 25, 2011Customer Satisfaction, Customer Service, Customer Service Experience Comments Off on Customer service at “stake” at Morton’s Steakhouse? Peter Shankman is an author and frequent customer service blogger who has an impressive 100.000 Twitter followers, so the other day he used an experience to allegedly show how companies treat their good clients. As he was preparing to take off from the airport at Tampa, Florida, Shankman tweeted to Morton’s Steakhouse Restaurant that he wanted a porterhouse steak waiting for him when he arrived at Newark Airport in New Jersey. So guess what? Morton’s Steakhouse transported a freshly cooked porterhouse steak to the baggage claim section of the airport when Shankman arrived; and notwithstanding all the bells and whistles of going over and above the call of “wow” customer service, had a waiter dressed in a tuxedo ready to serve Shankman his meal. I think, even though I do believe this was a premeditated Shankman ruse to bring media attention to the restaurant, and a good one in fact, but I don’t follow the tenet that this was any kind of display of customer service as Shankman contends. Over delivery of such a service isn’t even financially practical, and it is truly unbelievable and much too transparent a publicity stunt. Still the benefits of this grandiose scene can at least be a lesson in the importance of listening to social media. We can actually gain insight into what our customers need and follow through with their complaints, suggestions, and praises through consistent communication. Just look at the power of 140 characters and the attention it captured in one expensive though most likely positive afternoon.